SKF SNL Hookspanner Reliability Direct, Inc. Your Direct Source for Reliability, Maintenance, Test & Measurement! 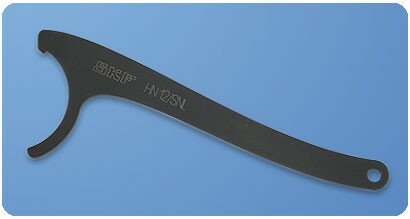 The hook spanners of HN /SNL series are especially designed to facilitate easy and quick mounting and dismounting of bearings with tapered bore on adapter sleeve in SKF SNL bearing housings. They are also suitable for tightening and loosening a wide variety of lock nuts in both housing and shaft applications. The HN /SNL series consists of 16 sizes suitable for nut outer diameter ranging from 38 to 145 mm (1.5 to 5.7 in). The spanners are made of hardened high quality chrome vanadium steel for durability. Designation is laser-engraved on the handle allowing easy identification and selection. Additional five larger sizes for nut outer diameter 155 to 210 mm (6.1 to 8.3 in) are available upon request. Easy storage due to hole in handle for hanging up.